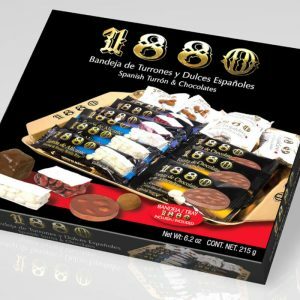 We are delighted to carry the most famous range of turron in Spain, from a company called 1880! 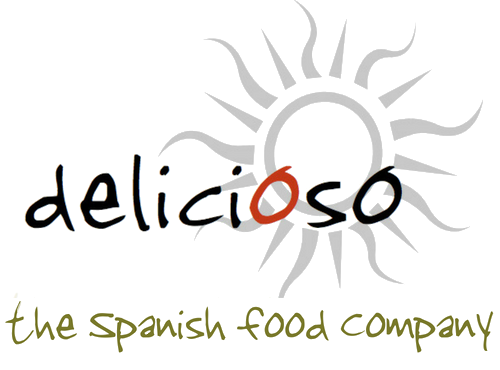 With top quality products and beautiful presentation, these are delicious and make great foodie gifts. 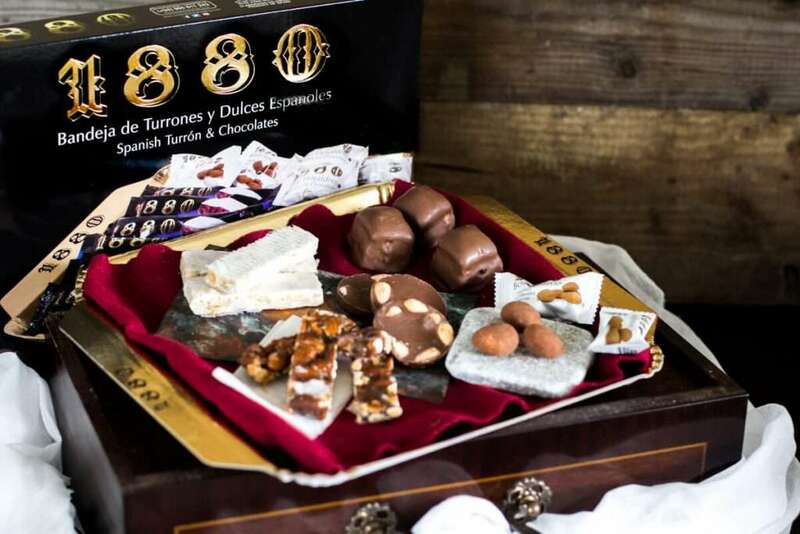 This is a classic tray of assorted Spanish sweet delicacies. 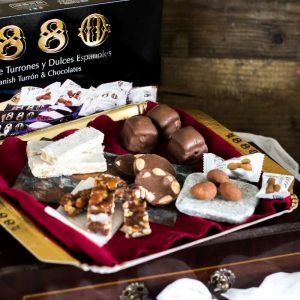 There are small portions of Turron de Alicante (hard turron), Guirlache (almond brittle), Chocolate turron rounds, Hojaldres (puff-pastries) covered in chocolate and 'Bombonias', cocoa-caramelised almonds. All presented on a tray with a lid to cover - perfect treats for the whole family! Read more about our producer here. INGREDIENTS: Turron de Alicante: toasted almonds, honey, sugar, glucose syrup, egg white, wafers (potato starch, refined sunflower oil). Guirlache: toasted almonds, honey, sugar, glucose syrup, wafers (potato starch, refined sunflower oil). 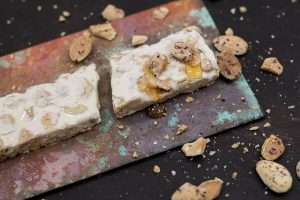 Chocolate Turron: Milk chocolate covering (sugar, cocoa butter, whey powder, cocoa paste, whole powdered milk, clarified butter, emulsifier (soy lecithin) aroma), almonds. Chocolate Hojaldres:Puff pastry (wheat flour, animal fat (antioxidant: butylatedhydroxyanisole, mono and diglycerides of fatty acids), wine, sugar, aroma and salt), milk chocolate (cocoa powder, sugar, cocoa butter, milk whey powder, cocoa paste, whole milk powder, anhydride butter, emulsifier (soy lecithin) and aroma). Bombonias: White chocolate covering (sugar, cocoa butter, whole powdered milk, emulsifier (soya lecithin) and vanilla), Marcona almonds, sugar and low fat cocoa powder. 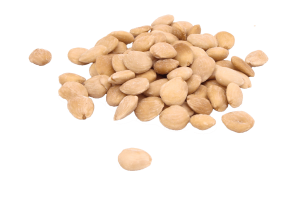 ALLERGENS: Contains almonds, tree nuts, peanuts, wheat (gluten), soya, egg and milk.